Someone once asked me to describe what summer tastes like. Well, that’s a no-brainer. Peaches have always been my long-time summer favorite and there’s nothing as simple and satisfying as biting into a ripe juicy peach. It tastes like sunshine and happiness! But when you combine that sunshine into a show-stopping peach crumble, life gets a little bit sunnier. My husband laughs at me because I’m that girl standing over the peaches at the supermarket giving each peach in the bin a squeeze to find the perfect one. In fact, the other day I found a bunch of them that were just right, so of course I bought waaaaay too many. (Alright, I not-so-secretly confess that I may have bought too many on purpose.) What’s a girl to do? 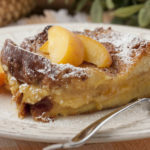 Go to mrfood.com, of course, to find an easy peach crumble recipe to make. 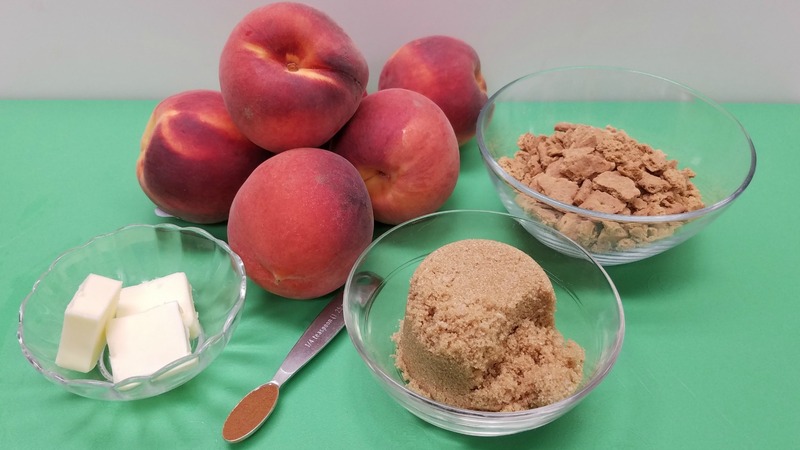 What I found was a simple, 5-ingredient recipe for Peachy Graham Cracker Crumble that takes about 10 minutes to prepare. Perfect! So, I thought I would share my discovery with you, while peaches are at their peak, and you can make it too. STEP 1: As always, gather all of your ingredients. To make this peach crumble, you’ll need peaches, brown sugar, graham crackers, cinnamon, and butter. 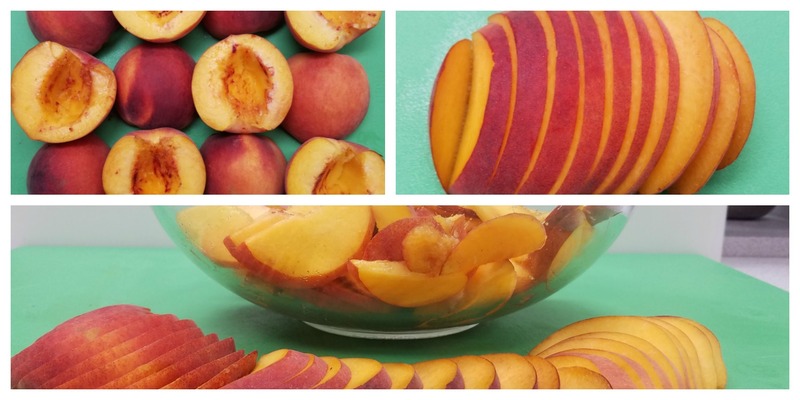 STEP 2: Cut the peaches in half, remove the pits, and cut each half into thin slices. I left the skins on because it adds a nice color to the finished dish, but you can peel them first if you prefer. 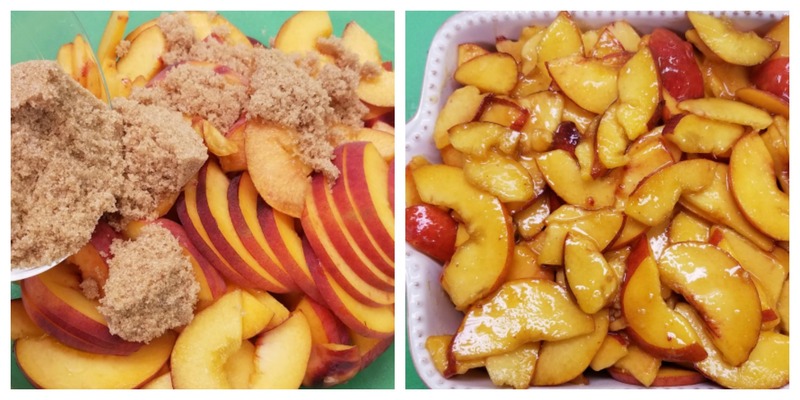 STEP 3: Toss the sliced peaches with brown sugar and then place them in an 8- x 8-inch baking dish. If you look at your bowl of sliced peaches and think, “There’s no way all of these peaches are going to fit in an 8×8 dish,” you are not alone. I thought the same thing, but, trust me, it’ll fit! STEP 4: Make the super-yummy topping by placing 8-9 graham crackers in a bag and coarsely crushing them. I left mine with some decent sized chunks to get a big crunch. Then, toss the graham cracker pieces with a little melted butter and cinnamon. STEP 5: Sprinkle the topping over the peaches and bake. Voila! It’s that simple! 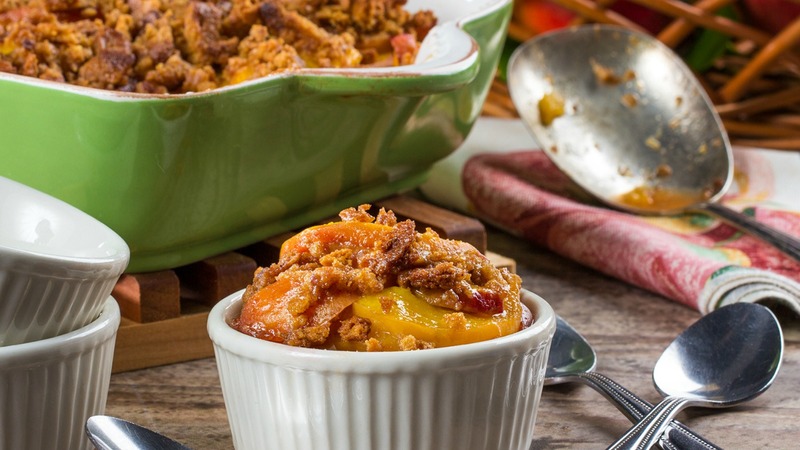 This peach crumble was so easy to make and could easily be doubled into a 9×13 if you’re feeding a crowd. Is your mouth watering yet? 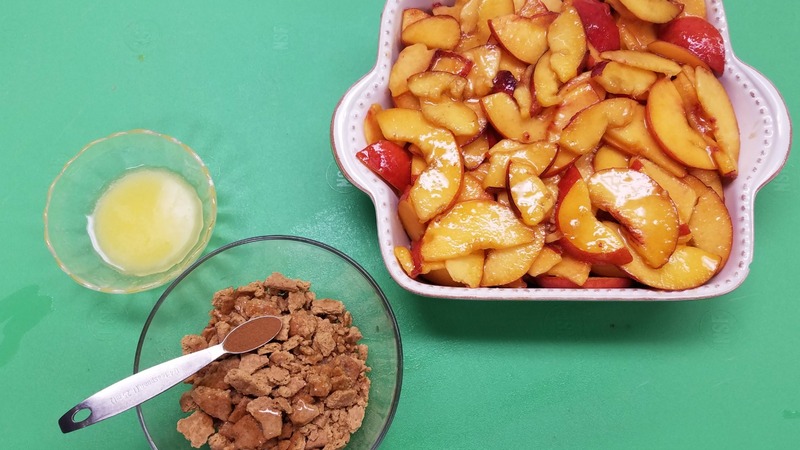 There’s lots of other ways to make a peach crumble, but I must say that the hint of cinnamon and the crunch from the graham crackers makes this one of my favorites. To get the full recipe for Peachy Graham Crackle Crumble, click here. Peaches and Cream French Toast – This easy-as-can-be French toast has a creamy peach filling that’s sure to brighten your morning. 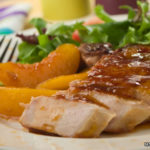 Peach Glazed Pork – These peach-glazed pork chops are perfect for any special occasion, but they’re easy enough to make any day, so why wait?! 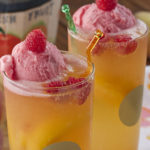 Peach Melba Cooler – Able to quench the mightiest of thirsts, this recipe has all the tastes of summer rolled into one refreshing beverage. 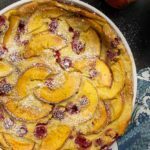 Raspberry Peach Clafoutis – Whenever I hear the word “clafoutis” (pronounced klafuti), I want to say “Bless You!” But seriously, you’ll love this easy French treat dreamed up by AnnMarie at www.justalittlebitofbacon.com. It’s made with the perfect fruit combination of peaches and raspberries. 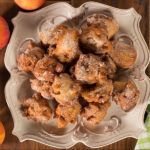 Southern Peach Fritters – Peaches and deep frying? Yes, please! 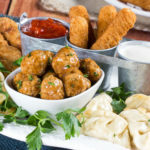 The tricky part will be keeping everyone away while you make a batch of these fritters. They’ll disappear quickly! 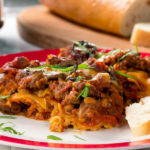 Do you have some great peach recipes to share? If so, I’d love to hear from you. What’s your favorite way to cook with peaches?